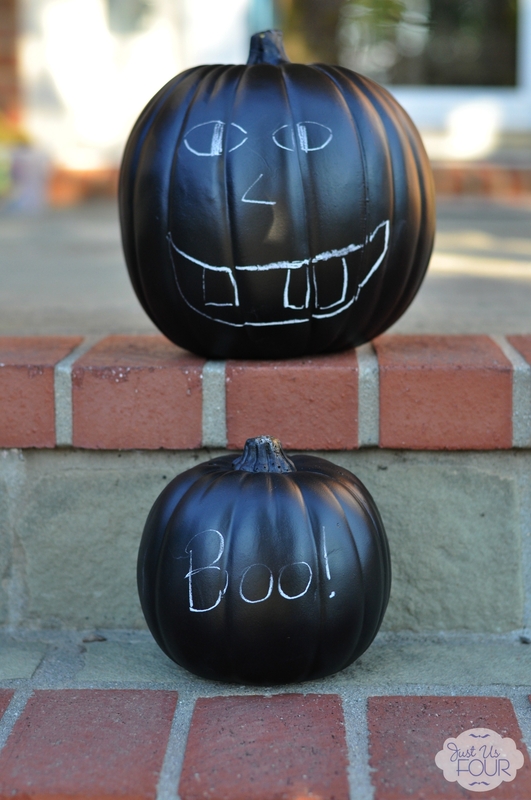 Artificial pumpkins are one of those craft items that you can do so many things with…carve, cover, paint, etc. The list really does go and on. Last year, I used some washi tape to decorate one for part of my Halloween decorations. 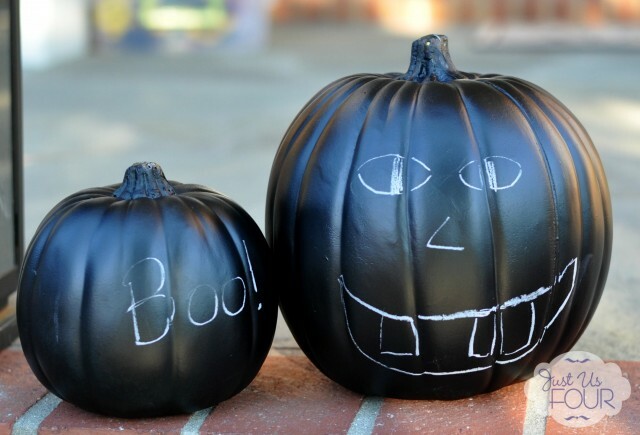 This year, I decided to create some chalkboard paint pumpkins so my kids could decorate them over and over again between now and Halloween. 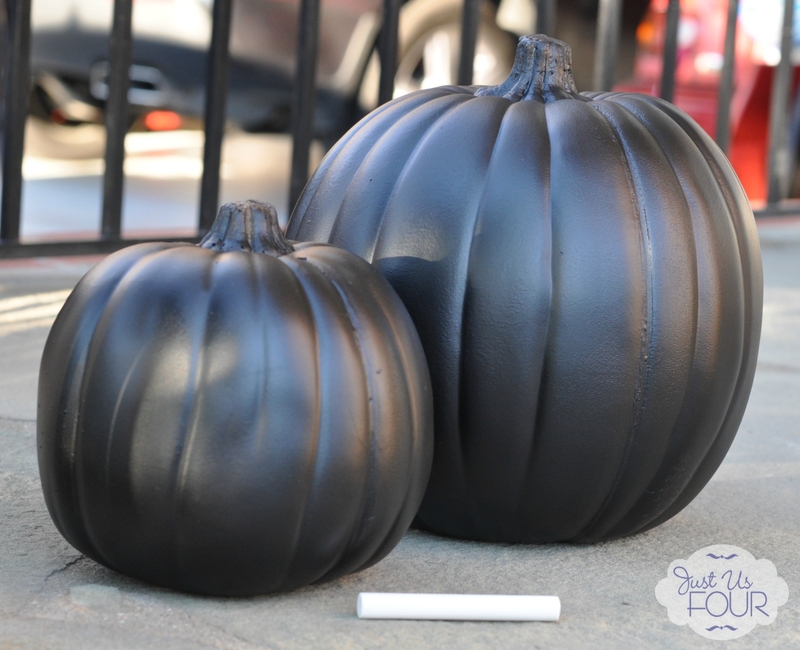 This is one of those tutorials that is so simple that it barely needs a tutorial but I wanted to share with you what I did in case you are thinking of making some chalkboard paint pumpkins of your own. First, pick out your pumpkins. Just like at the pumpkin patch, there are lots of shapes and colors. I picked white for this project but it really doesn’t matter. Next, choose your paint method. I originally thought about hand painting them but decided spray paint would be so much faster. 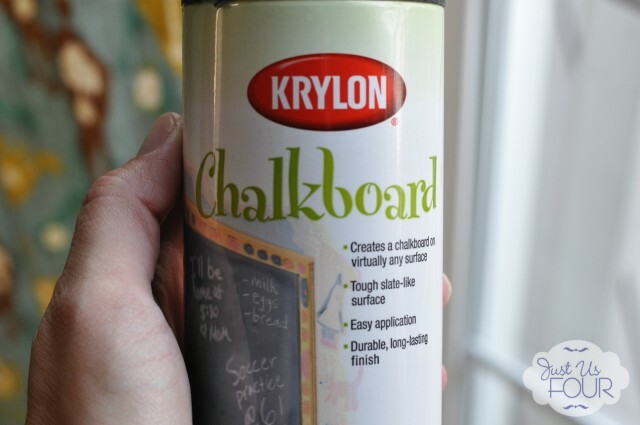 So, I grabbed a can of chalkboard spray paint. 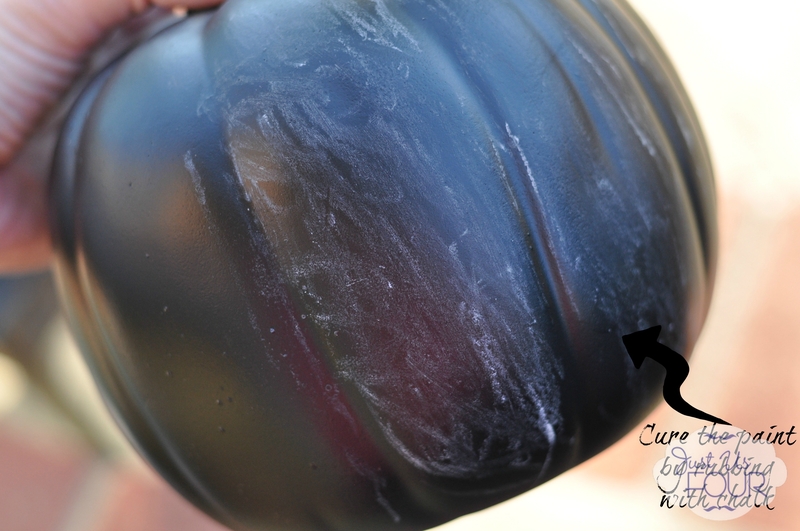 Spray several very light coats onto your pumpkins. Seriously, light is the key word here. You are going to need 2-3 coats minimum so go light knowing this from the start. NOTE: Be sure to read the can for your spray paint to determine the wait time between coats. It ranges for each brand so pay attention because it really does matter. Once your pumpkins are all dry, leave them for 24 hours. Then, rub the entire service down with chalk to cure the paint. How do you typically decorate your pumpkins? 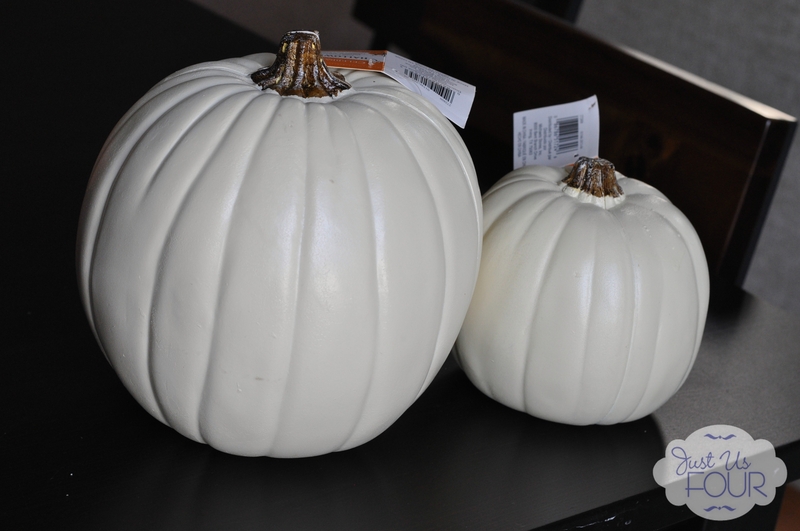 Do you use a lot of artificial pumpkins around the house to make it easy to reuse year after year? Thanks! I love how they turned out and the kids are having a blast drawing on them. I love this idea! 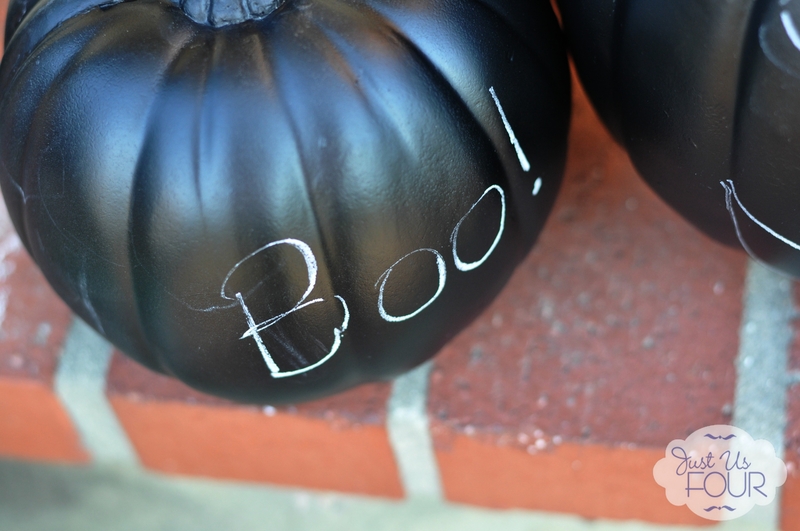 I never thought of using chalkboard paint on a fake pumpkin, but what better way to change things up. I bet your kids just love them. I love this idea! I bought one of those fake pumpkins last year at Michaels with the intention of carving it, but I think I might do this instead. Thanks for sharing. I tend to store a bunch of faux pumpkins so I always them around to use for crafts. This is so cute. We did pumpkin carving last year. But, I like this idea so I think we are going to give this a go this year. We typically do pumpkin carving but it happens so late in the season so the pumpkins don’t rot. This year, we started with the chalkboard pumpkins so the kids can still have some fun early. I love this! I love chalkboard everything and these are so cute! The pumkins look so sleek in black! I’ve seen lots of DIY pumpkins this year but this is the first chalkboard pumpkin I’ve seen. I love this idea, thanks for sharing! Thanks! We have been having a blast drawing on these. So clever! Love it! This could be really fun for homeschoolers! Math on a pumpkin- writing on a pumpkin! So cool! Thanks for the tip! Oh…great ideas! I love the math on the pumpkin. This is a cute idea. I wonder what other ways I can use the techniques here to decorate with my children. Janeane Davis recently posted…Need to Take Action Now? Ask For Help! This is such a CUTE idea!! My kids would love this because they can decorate them over and over again! That is definitely what my kids keep doing…over and over! Thanks! We have definitely had fun drawing on them. I love this idea. I can see my son drawing the face on over and over and over again. Now I don’t like the curing step with the chalk but everything else looks easy as pie. These are adorable!! Great idea for my classroom! I am doing this!!! Laurie – Steals and Deals for Kids recently posted…Hi Ho Cherry-O Game Only $5 (reg. $14.99) + FREE Shipping! Oh, this would be so great for a classroom. I think I will donate one of these for a countdown pumpkin to H’s classroom. This is a really cute idea! My kids would love this project! Thanks for the idea! Amy Desrosiers recently posted…Barney Most Huggable Moments 2-DVD Set! Thanks so much! It is definitely fun for the kids. Thanks! We are having so much fun with them. Ahhh, that is so adorable! Totally LOVE this idea! I love everything Halloween & pumpkin decor! LOVE this idea!! We carve a couple pumpkins each year, but I always like to paint or somehow decorate and artificial one each year to keep for the coming years. Looks like a found a great one for this year 🙂 Thanks! We carve them too but I love the idea of having something that I can use over and over. This is super fun. I’m going to pin it! Love, love the idea! Thanks! We have had so much with these. Carmen’s Coupon Blog recently posted…Ends 09/30 – Erin Condren Gift Card Giveaway! I love your idea! We may use one as a countdown until Halloween. It came out really nice. and I like the idea Carmen suggested to draw a new face everyday. I love Carmen’s idea too! You can easily change the face or writing on these daily. That’s a very creative way to decorate pumpkins! Motherhood on the Rocks recently posted…You Chose the Hallmark Card! So What Did My Mom Think Of It? Thanks! The kids have so much decorating them over and over. These are ingenious! Every year my daughter can’t decide how to decorate the pumpkins, and this would be tons of fun the whole year around! I’m pinning this, and we’re going to give it a go this weekend! What a great idea for kids…they could decorate over and over! This would be great to link-up to Create It Thursday #22…it’s live now! Hope to see you there! 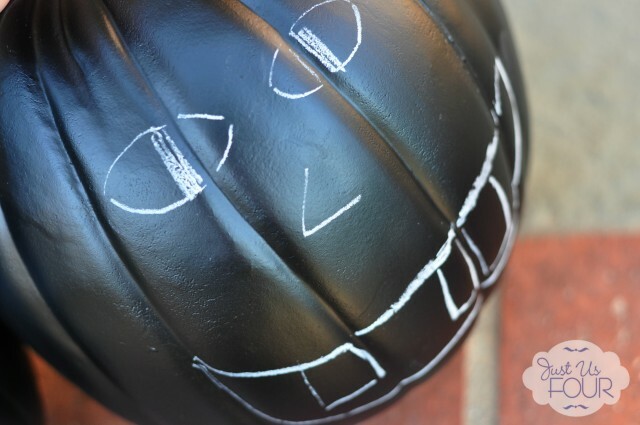 The kids definitely love decorating these over and over. Thanks! Definitely paint those pumpkins. They are so much fun to color over and over. Fun idea. So many things you could do with this! Thanks for sharing. I’d love for you to come join our Halloween Party!!! Thanks so much for coming by! I am headed over to check out your party.